This is my second dish for Save the Children and the Live Below the Line challenge. From 29 April, thousands of people will be getting sponsored to live below the extreme poverty line for five days, with just £1 a day to spend on all their food and drink. I’m not sure I could do it. But I’m playing my part, in a very tiny way, by trying to come up with some vaguely tasty dishes that cost less than 40p a serving to prepare from scratch. My first offering was a Virgin Bloody Mary soup made from cheap tinned tomatoes and a red pepper, costing less than 34p a bowl. 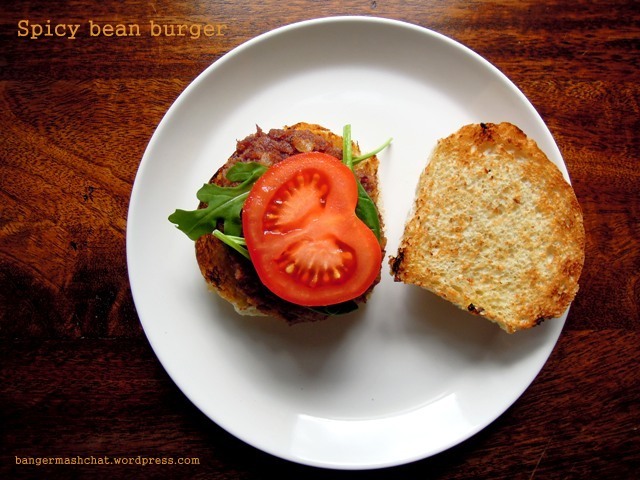 I’ve managed to save an extra halfpenny (not that they exist anymore) with these spicy bean burgers. 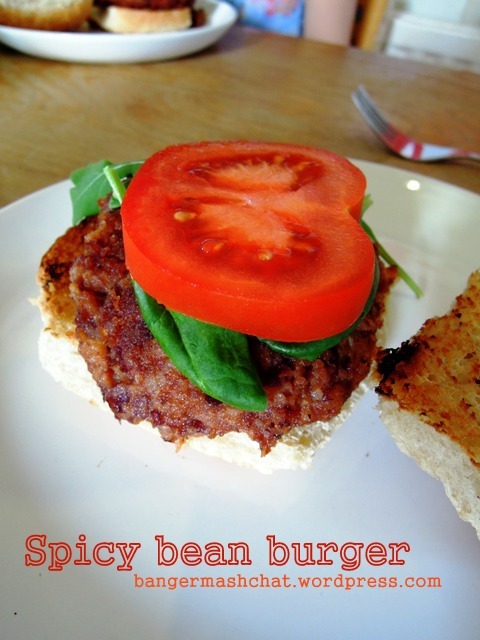 Based on cheap tinned kidney beans pimped with garlic, cumin and paprika, this recipe creates four burgers costing just 33.5p each. You could probably even allow yourself a dollop of mustard or tomato ketchup. What luxury! But no skinny fries on the side I’m afraid. Heat 1 tablespoon of the oil in a frying pan and gently fry the onion until soft and golden. Add the cumin, paprika and garlic and fry for a couple more minutes but don’t let the garlic brown. Remove from the heat and leave the onion, garlic and spices to cool a little before you add them to a food processor. Next add the drained kidney beans, breadcrumbs, salt and pepper. Blitz but not for too long – you want a fairly chunky texture. Shape by hand into four patties. Heat the remaining oil in the frying pan and fry the burgers over a medium heat until cooked through and crispy on the outside. Turn them over gently to prevent crumbling. Serve in toasted buns with a slice or two of tomato and some lettuce leaves. As with my last Live Below the Line dish, I’m also entering this into April’s Credit Crunch Munch co-hosted by Helen from Fuss Free Flavours and Camilla from Fab Food 4 All. If you’re looking for frugal food ideas, this is a very good place to start. I’m so impressed by your two delicious looking recipes created on such a tight budget. These look totally yum, and I’d never have guessed so cheap! The only fast food I’ve ever craved was a Burger King Spicy Bean Burger but it’s probably been a decade since I had one of those, they probably don’t even make them anymore?! Your version looks considerably healthier….and cheaper! Will definitely be making. 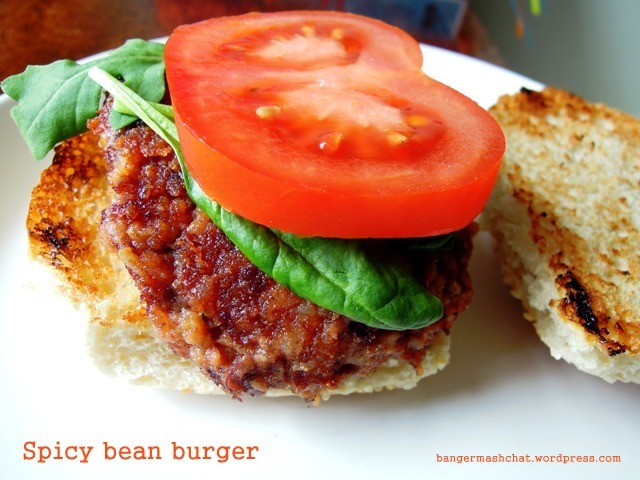 Think I’m going to have to make your burgers as I now have a serious Spicy Beanburger craving! I made the burgers yesterday and was impressed, both with the easy recipe and with my cooking! I’m not a great fan of spicy foods so I think next time I would hold back on the cumin but they were certainly tasty and filling and healthy too. That’s so good to hear Helen – thanks for the feedback. And yes, I am probably a little heavy-handed with spice as I’m rather partial to my spicy food – so note to self that I might need to point this out when writing up recipes! I don’t think you’re getting the idea luv. Make five days worth of food for five pounds in total.